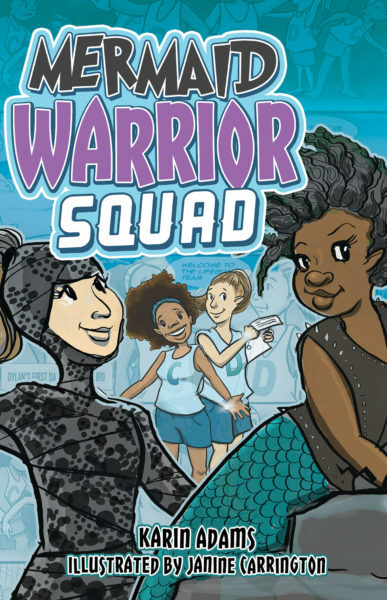 Mermaid Warrior Squad is Karin Adams’ fifth book for young readers. With her usual humour and knack for getting to the heart of real-world, real-kid friendships, this summer arts camp-themed story unfolds in short, snappy chapters along with an exciting ‘comic book’ subplot! As shy Dylan navigates the choppy waters of intense camp friendships, her vivid imagination creates a parallel story played out in comic book panels (gorgeously illustrated by Canadian artist Janine Carrington). Can Dylan harness the strength of her comic book alter ego – the mermaid warrior ‘Driftwood’ – in order to foil a plot to prank the art showcase, and stick up for her camp bestie?